Sustainability Labs: Neukölln - GreenBuzz Berlin e.V. Put your ideas into action at our second Sustainability Lab in Neukölln. Form or join a team to decrease co2 in your neighborhood. Hydroponic Vertical Garden: There is a lot of bare walls in Berlin, 4 stories high, no windows, vast useless emptiness. Until now. Let us use this space to automatically grow plants in vertical gardens, eat CO2, clean our breathing air & create a canvas for natures wonders. Can Hydroponics (water bath instead of soil) ease the environmental control and enable us to create new concepts of vertical gardens? Saubere Luft e.V. is going to be a community platform to support specific local actions and goals in reducing air pollution in Neukölln. The air in many of our streets is heavily polluted and hazardous for health and well being. The goal of this challenge is to bring the value of clean air to the top of everyones attention and brand “saubere Luft” (clean air) as a human right by founding Saubere Luft e.V., as well as by taking action for more space for bicycles and pedestrian and how to increase the number of electric busses, cars and bikes. Zoo Compost Stations: An experimental station is transforming food waste into high-quality bio-eggs, protein and compost. This pioneering initiative in Europe is able to manage 50% of the total municipal waste in the same neighbourhood where it is produced. No trucks, no incinerators, no CO2. In this challenge we want to find out how this system could be utilised in Neukölln to support a Zero Waste lifestyle in the city. Do you want to exchange your waste for eggs? Join this challenge on Sunday! To participate please make sure to register for a ticket. Places are limited! You will have 2 follow-up meetings with your coach which will be timed with your coach in the weeks after the event at CRCLR. In between the meetings, you will be working individually on your idea by getting more information, to do networking, build the first prototype etc. Those meetings will be 3-4 hours long. 2nd meeting: We will evaluate the status. What has worked so far? Where do you still need some more support? 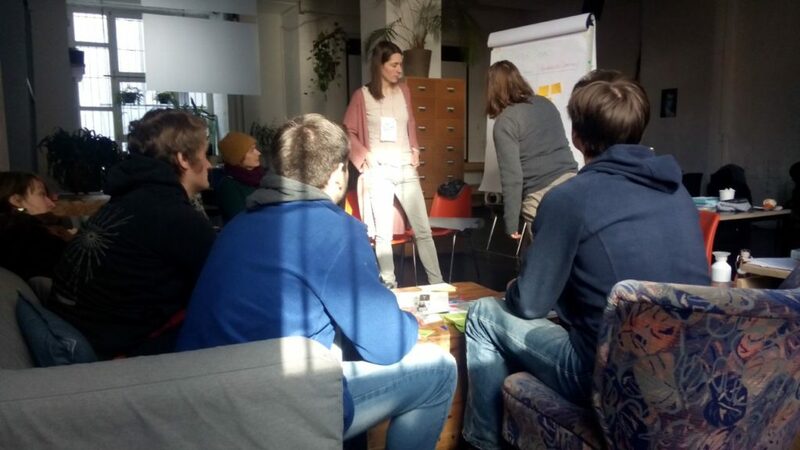 At our first Sustainability Labs we worked on 2 challenges to make Kreuzberg more sustainable!